Stepping up its use of unmanned aircraft, the military is encouraging the FAA to open airspace for training purposes. 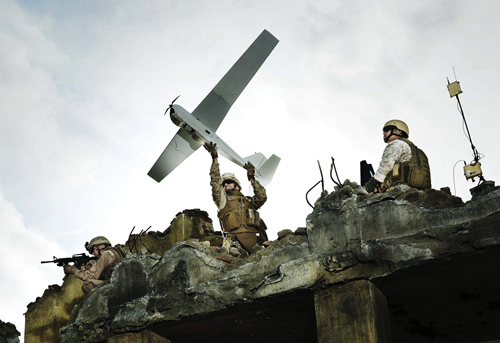 The U.S. Army has been using small unmanned aircraft such as AeroVironment’s Puma, above, in Iraq and Afghanistan. The expected release in December of a proposed rule governing the operation of small unmanned aircraft systems (sUAS) in the U.S. national airspace system (NAS) will be a definitive step in the phased introduction of robotic aircraft in civilian airspace. The sUAS notice of proposed rulemaking begins a comment and review process that could see a final rule issued in mid-2013, FAA executives say. Assuming the FAA follows the recommendations of its sUAS aviation rulemaking committee (ARC), the rule will serve as the regulatory basis for allowing UAS weighing up to 55 pounds to operate in the NAS “for compensation or hire.” Meanwhile, in June, a new ARC was formed to make recommendations on issues arising from wider introduction of unmanned aircraft into the airspace. Unmanned aircraft in the U.S. can operate only in restricted airspace or through certificates of authorization (CoA) issued by the FAA to public agencies. A commercial entity that seeks to operate a UAS must obtain a special airworthiness certificate-experimental category (SAC-EC). As of this summer, there were 285 active CoAs and 15 active SAC-ECs, according to the FAA. The sUAS ARC divided unmanned aircraft into operating groups ranging in max takeoff weight from 4.4 pounds, about the size of AeroVironment’s hand-launched Raven, to 55 pounds, around the size of Insitu’s NightEagle. The committee recommended the largest aircraft be restricted to “extremely remote” Class G airspace. UAS operating at or below 700 feet agl would have to be at least 5 nm from a military or charted airport or heliport; those operating from 700 feet to 1,200 feet agl at least 10 nm distant. One or two visual observers would be required for operations less than 10 nm from a charted airport. Industry pressure has been building for years to open wider airspace access for unmanned aircraft capable of a wide variety of “dull, dirty or dangerous” missions. The U.S. military wants more access for training purposes, a requirement that is intensifying as units return from Iraq and Afghanistan with their unmanned assets. The Department of Defense envisions 144 future operating locations in the U.S., according to Dallas Brooks, chairman of the Pentagon’s UAS Airspace Integration integrated product team. But merging UAS with airline and general aviation traffic poses substantial technological and other challenges, chief among them the need for unmanned aircraft piloted from the ground to “sense-and-avoid” other air traffic. One of the expected enabling technologies for sense-and-avoid, automatic dependent surveillance-broadcast (ADS-B), won’t be required for manned aircraft until 2020. And ADS-B can’t be counted on for collision avoidance unless all airspace players are equipped. Insufficient to begin with is the venerable traffic alert and collision avoidance system (Tcas). At the Unmanned Systems North America conference in August, Steve George, an aerospace engineer with the FAA’s Unmanned Aircraft Program Office (UAPO), summarized findings of a recently completed analysis of Tcas on an unmanned platform. Relying on a Tcas traffic display “for self-separation is unsafe in A, B, C, D, E and G airspace,” George said. “The representation of the traffic situation is inaccurate, potentially incomplete and misleading. It’s unsafe to be used as the sole basis for maneuvering.” However, Tcas could serve as a component of a larger sense-and-avoid solution, he said. Johnny Walker, co-chairman of RTCA Special Committee 203, which is formulating UAS system characteristics, said his group plans to deliver minimum aviation system performance standards (Masps) for UAS in December 2012 and for sense-and-avoid and control and communications requirements in December 2013. He also broached a sleeper issue that could slow introduction of UAS to the NAS: the need for precious radio spectrum for command and control data transmissions between pilot and aircraft, as well as for sense-and-avoid and payload applications. SC-203 “cannot finalize Masps,” Walker said, until available radio spectrum and frequency bands have been ratified at the World Radio Conference in Geneva, scheduled to begin in January. The reported progress notwithstanding, the UAS industry wants quicker airspace access. Retired admiral Tim Heely, who chairs the UAS advocacy committee of the Association of Unmanned Vehicle Systems International, which sponsors the Unmanned Systems conference, said the association aims to “accelerate or at least keep on track” the integration of UAS in civilian airspace. “The progress is slow–too slow for what’s going on here,” he lamented.